ChargeIt by Jay Alinea Silver Glass Charger Plate 13"
Home > Products > ChargeIt by Jay Alinea Silver Glass Charger Plate 13"
Add a classic and romantic charm to any wedding reception or formal event with the ChargeIt by Jay Alinea Silver Glass Charger Plate 13". Beautifully accented with an intricate design that resembles early 20th century style, this charger plate exudes unparalleled elegance and sophistication. 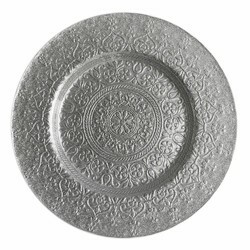 Thanks to its brilliant silver hue, this charger easily complements any table decor and upscale dinnerware. Made from solid glass, this premium quality charger plate combines a delicate look and unbeatable durability. To retain its luster, this charger plate must be hand washed only.